sort of effort should be made to look moderately socially acceptable. What I will say is, over the years I've tried and tested various products and techniques. I've found what works for me and I never stray far from it. 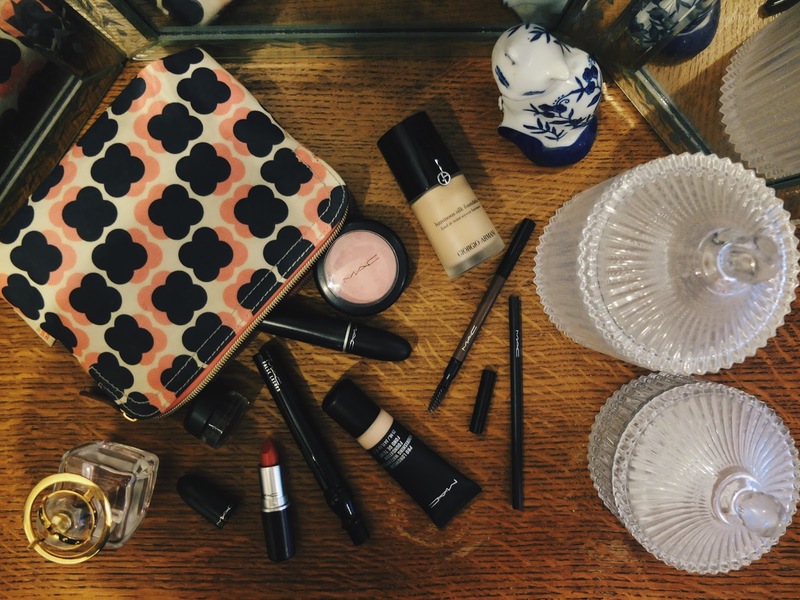 Sure, every now and then I might mix up my lip shade, outfit dependent or my blusher, tan dependent but it's effectively always the same formula. For a while now I've had a lot of lovely comments on Instagram about my make up and I get asked quite a bit which mascara, lipstick, eyeliner etc I use. These kind of question is usually met by extremely useless answers such as "erm... It's the one with the fancy lid", or "it's the one with funny brush" and "it's the one that does the thing, you know, with the thingey"... Case in point, I'm not an expert. 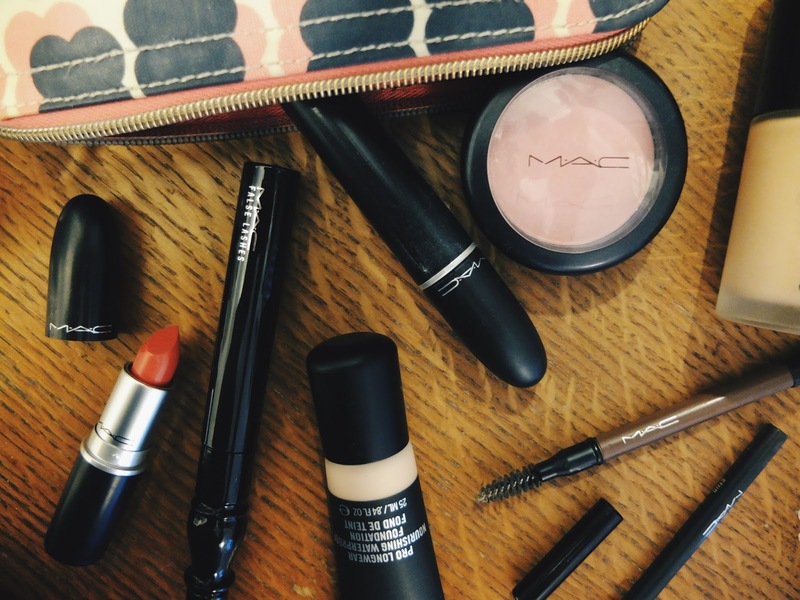 But ask and you shall receive, I've put together a sneaky peak of what my make up bag consists of. 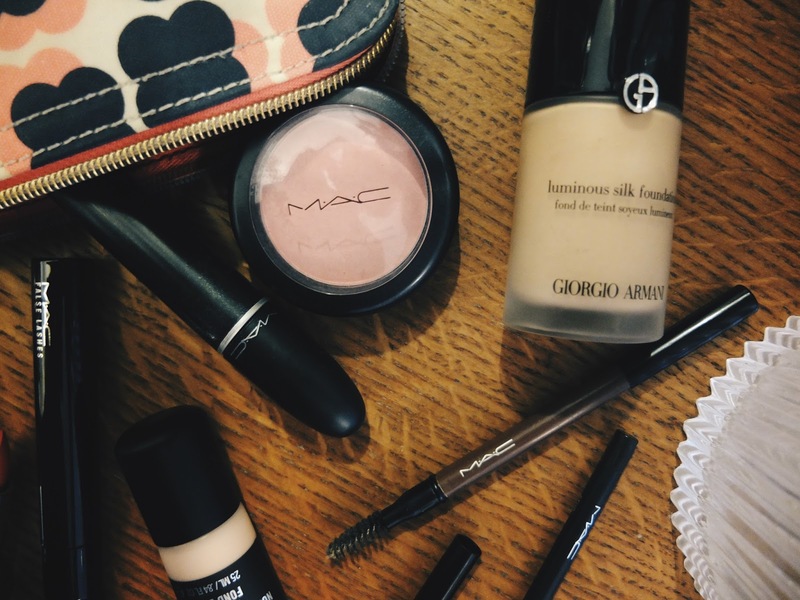 My never changing, trusty, every day (give or take) essentials I just can't live without... Possibly a little underwhelming for some of you, but for those who have asked about my make up over the past few months... You finally get a straight answer. Hooray and taaaa daaaaa!! 1. Foundation- For every day I use Mac Pro Longwear Nourishing Waterproof Foundation, it's kinda light and it's not too matte so you can wear it striped back with just mascara for a natural (aka I can't be bothered) look. You can also however, build it up for days when your skin hates you and it will give ace coverage. My skin is so awkward, I have freckles on my nose which I love and would hate to hide away, but I suffer outbreaks of spots which I desperately want to cover and this foundation creates that happy medium for me. At night I use the holy grail of foundations, Armani Luminous Silk foundation. I'm pretty sure this stuff is produced by elves and has magical powers- it's aaaamazing. It sits so well on my skin and it doesn't budge or melt off as the night goes on, which is ideal for those of you who wear liquid eye liner as it helps your perfect cat eye flick stay put! I use a Mac 187 Duo Fibre Brush to apply both foundations; its light, "wispy" bristles mean it won't go on too thick from the get go. It's a great brush for blending your foundation in fully and controlling perfectly just how light/heavy you want it. 2. Eyes- Probably the area I get asked about most and it's the one make up routine I haven't changed in yonks. 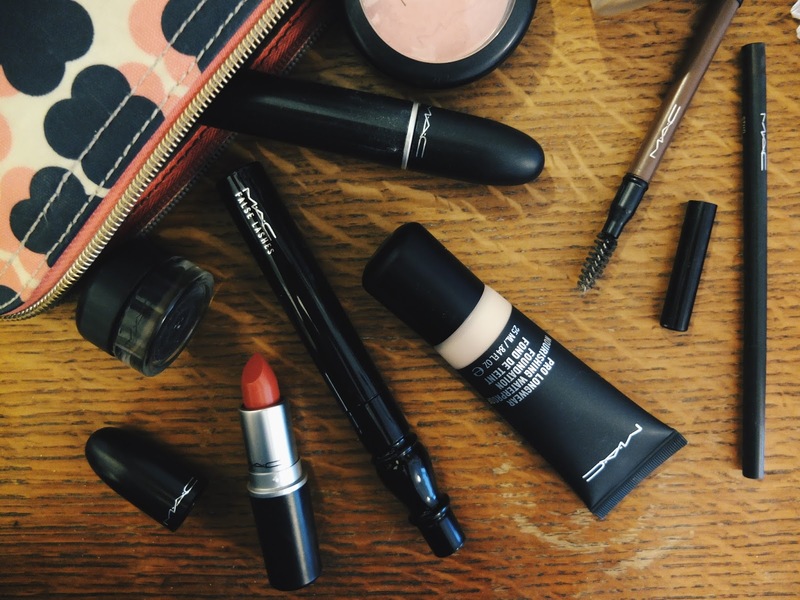 I use a pot liner from Mac called Fluidline in Black Track and to apply it I use a Mac 266 Slanted Eye Liner Brush; for me a pot and brush means you have a lot more control over what you're actually applying. 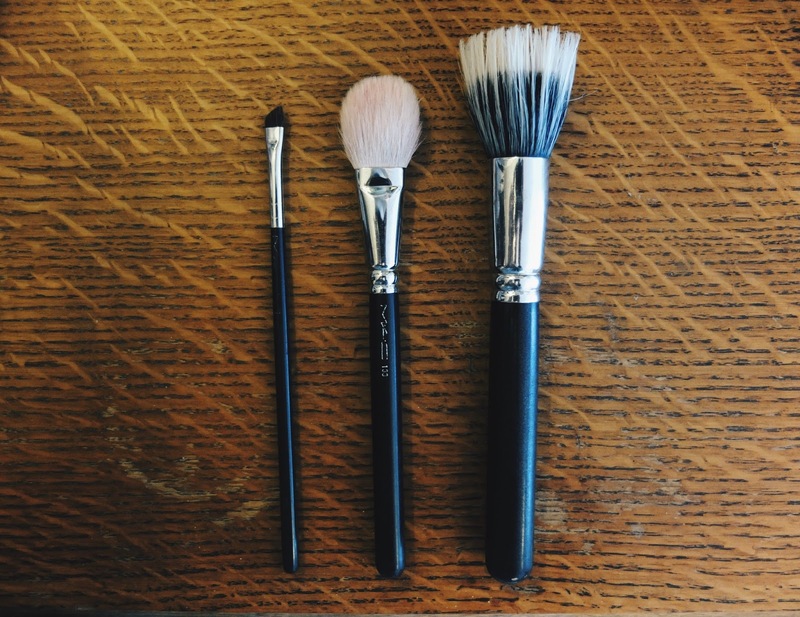 Start off small and build up as your hand gets used to holding the brush. A slanted brush well seeeeeriously help create that flowing, fluid flick you're hankering after. I will try and get a eye liner flick tutorial out there for you all one day because I do get asked about them a hell of a lot, but for the time being please believe me when I say it's PRACTISE!!! I repeat, let your hand get used to the brush. A shaky grip will be your downfall. Mascara wise, I use Mac Upward Lash. The wand is teeny weeny so it applies naturally and clump free, whilst giving you those long spidery lashes we're all after. For night time I use Mac False Lashes Extreme Black (can you tell I invest a lot of faith in Mac?). Whilst having a lid which looks very similar to Darth Vader, this mascara is extremely trustworthy and does exactly what it says on the tin. If you're after sixties style eye make up like mine whilst wanting to stir clear of fake eyelashes, then this mascara will do the trick! Big and bold! 3. Brows- Mac Veluxe Brow Liner in Soft Mute Beige comes with both the liner itself and a brush to groom any unruly hairs- it's soft so you can do lots of mini strokes to create natural looking brows rather then looking like 2 big scary slugs. Yuck. 4. Lipstick/Blush- my blush is called Well Dressed; Bronzed tones just do not suit my skin colouring and makes me look like I'm a Victorian Chimney Sweeper. I just look grubby. Fresh, vibrant pinks not only make the boys wink apparently but also work worlds better for me (win/win, maybe), they give a much softer look. Well Dressed has a slight shimmer to it also so it acts as a great highlighter. I use it on the bridge of my nose and arch of my eye brows as well as cheeks, to create a little sun blushed look *does the kiss to hand/tips of fingers gesture as seen done by all French chef stereotypes*. Lastly my one true love, my lipstick. 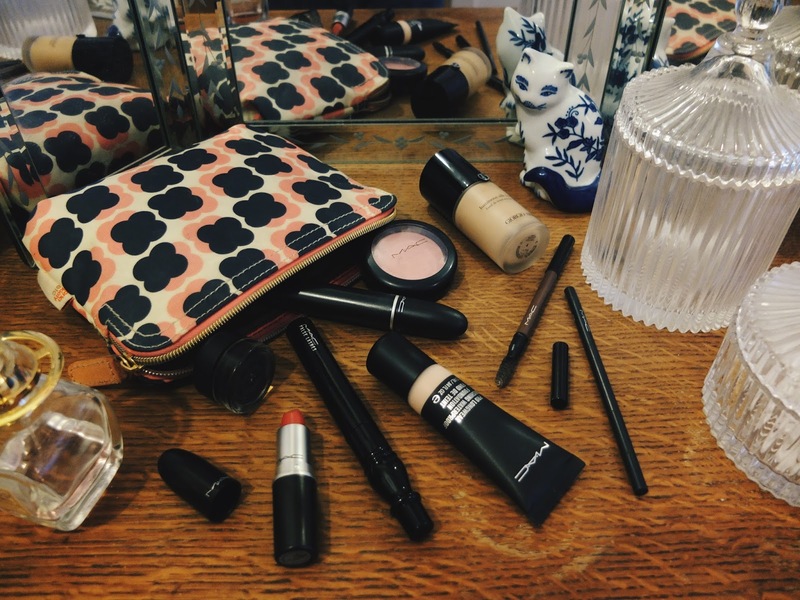 It's corally, pinky, sheer, loveliness and I couldn't live without it. 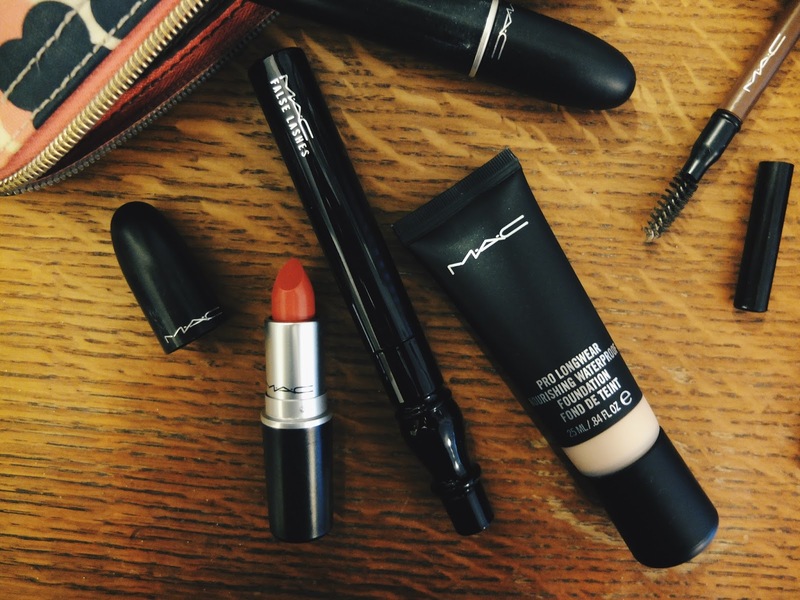 It's Mac's See Sheer shade and it's an all round winner with every outfit. It's vivid yet sheer, so it's not too over baring for the day time. I tend to go really pale in winter and really tanned in summer, zero in between (I'm half Middleton, Manchester/half Naples, Italy... The struggle is real) and this kind of peachy, coral works really well with both skin tones. That said I kinda think lipstick shades are really subjective to personal taste rather then recommendation. I also think lipsticks are for having fun with and testing out new looks, don't be too serious with it. My perfect shade maybe your worst nightmare. Other shades I love include; Creme Cup (Baby Pink), Russian Red (Deep Red) and Shanghai Spice (Warm Peach).